Spring Has Sprung at Saratoga Springs. Thank you to Chef Brian Sterner of Gideon Putnam Resort for putting this post together. I support so many of the ideas and thoughts he talks about in it. Spring has sprung in Saratoga Springs and Putnam’s at the Gideon Putnam is ready to showcase it! 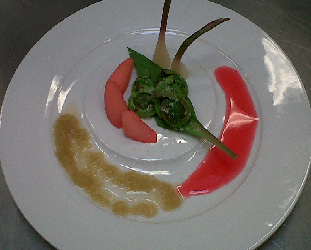 This season I have decided that I wanted to showcase a daily dish from the market called the Farm to Fork plate. I want to use this dish as an educational tool for my Sous Chefs and Line Cooks (myself as well! ), and our clientele. I feel it’s very important to cultivate relationships with our local farmers and what better way than to see them weekly and discuss what’s on their table. Now, I can bring these items to our guests’ palates and teach them what we have to offer in our region. Many are surprised with the amount of goods we have available to us from within a 30 mile radius. Along with this great plate we also feature a New York Artisan Cheese Board. We will be playing with Purslane soon … I will put together a story on these in the future! My team and I look forward to all the new and exciting farm goodness that is sure to follow………. This entry was posted on Tuesday, May 17th, 2011 at 5:52 pm and is filed under Uncategorized. You can follow any responses to this entry through the RSS 2.0 feed. You can leave a response, or trackback from your own site.